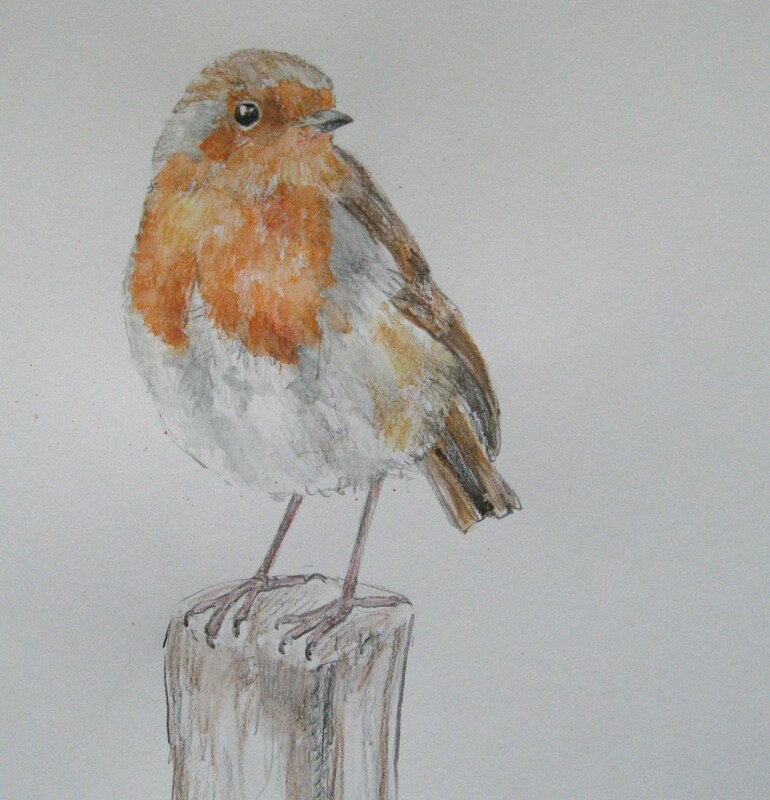 Hello again to my poor neglected blog! 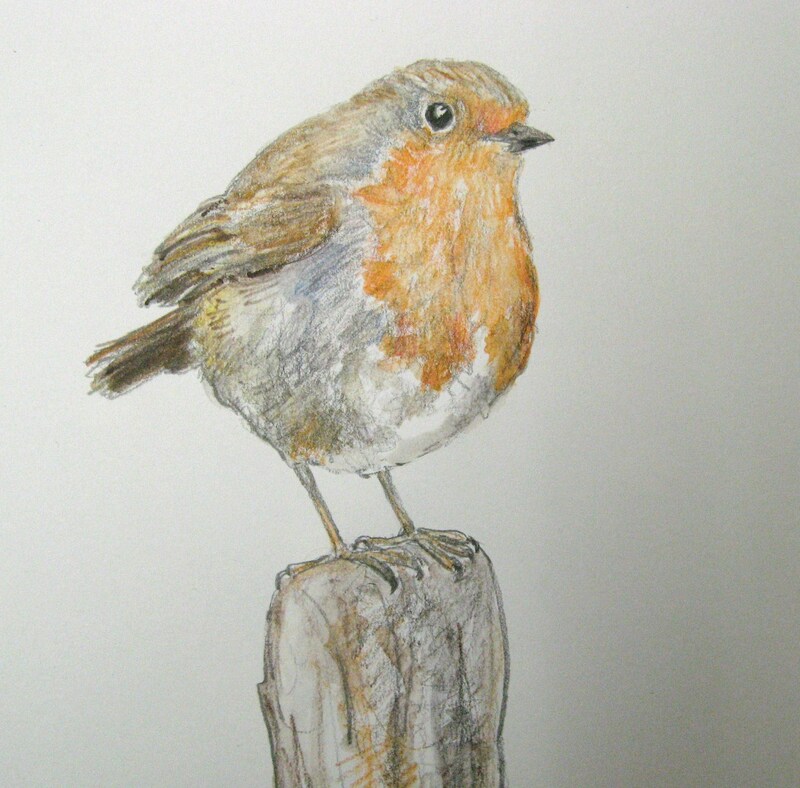 Here we are in October already, the summer flew past and now it`s Autumn with Christmas fast approaching. 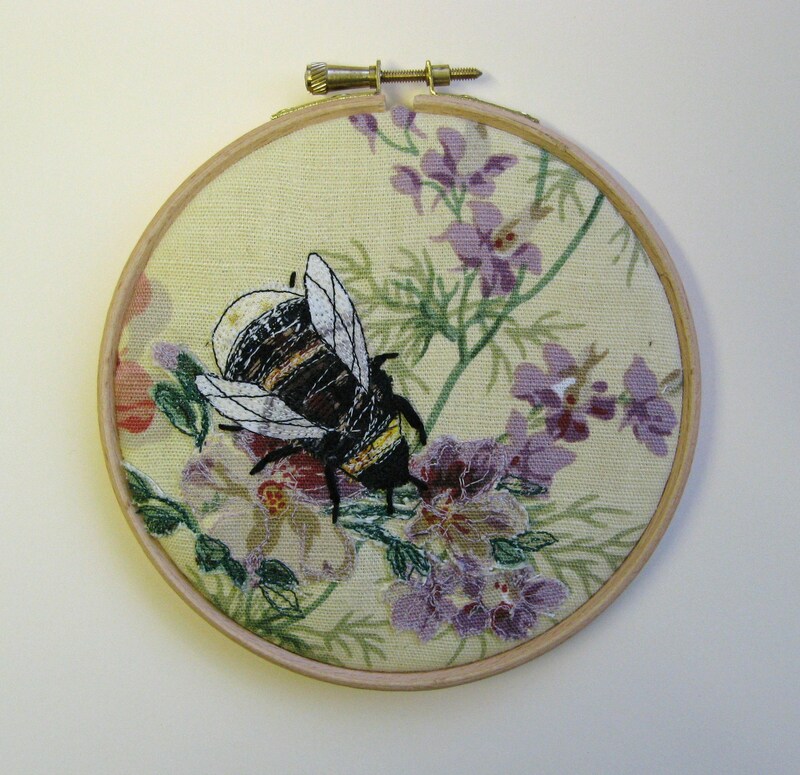 It has been a very busy Summer for me and a creatively satisfying one. 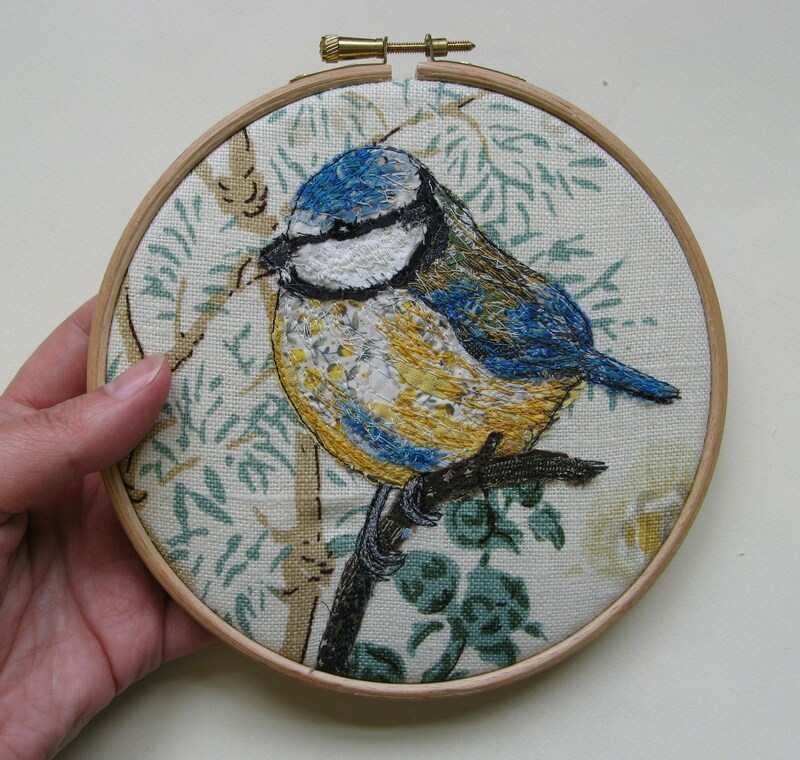 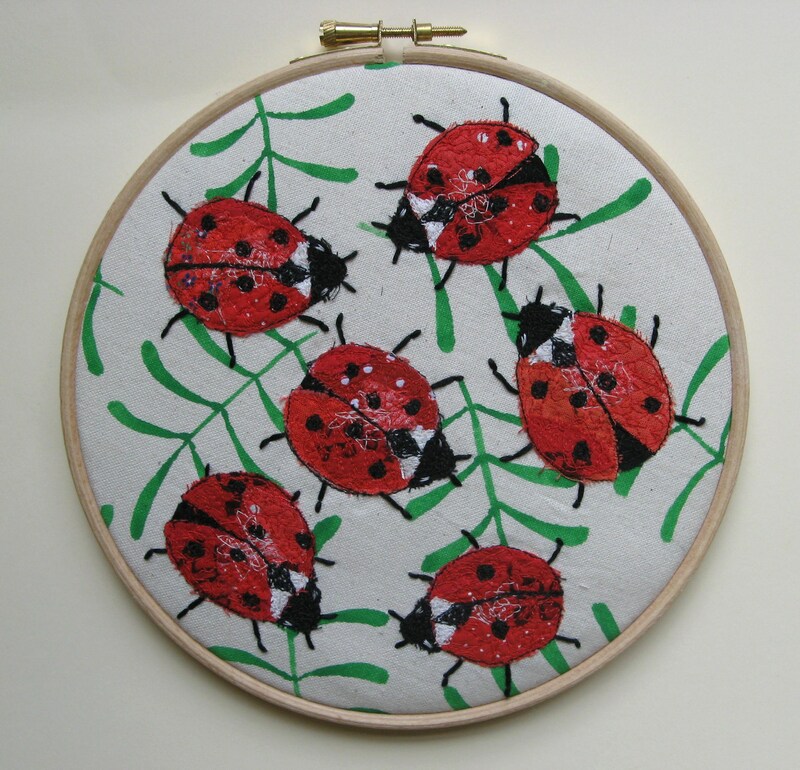 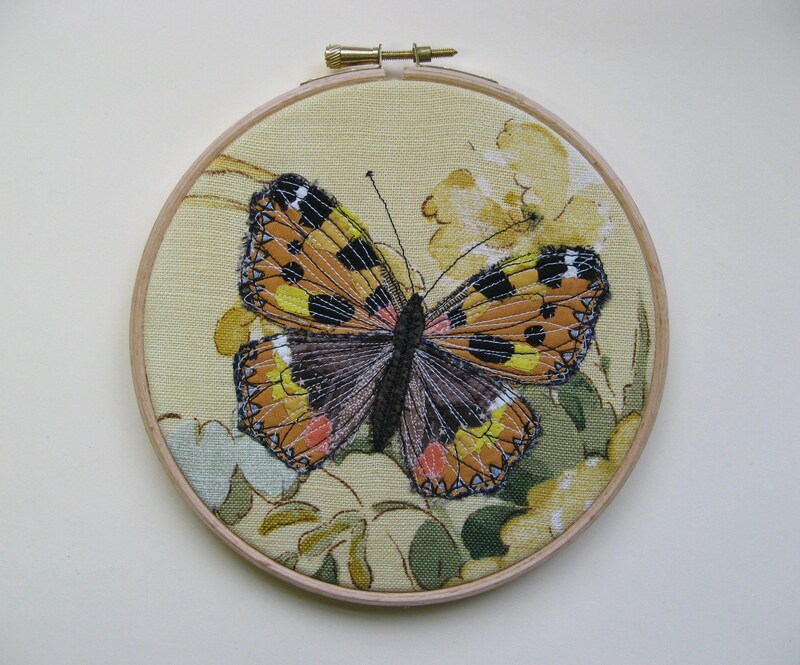 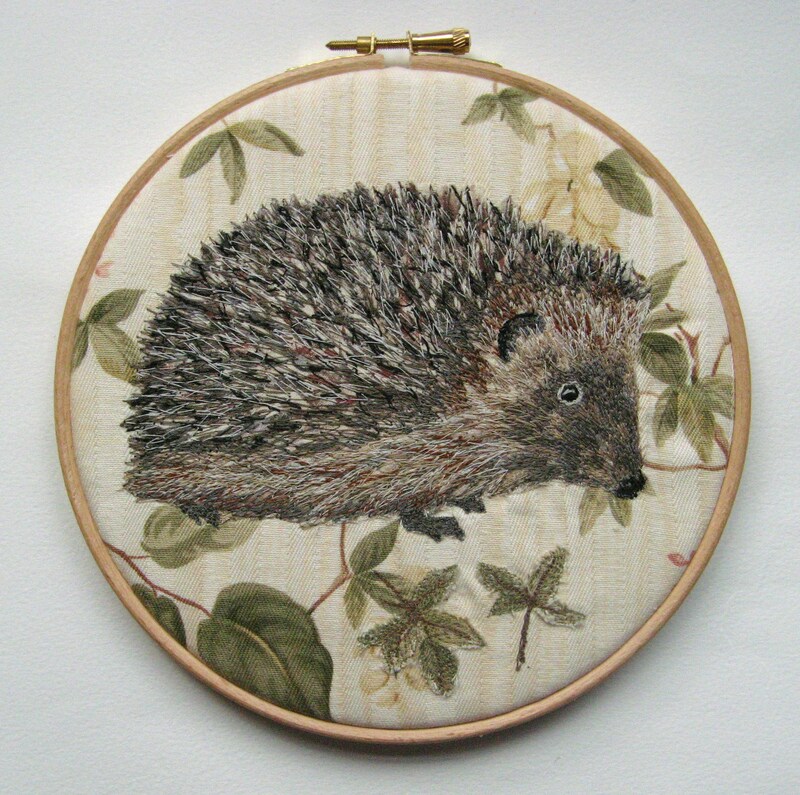 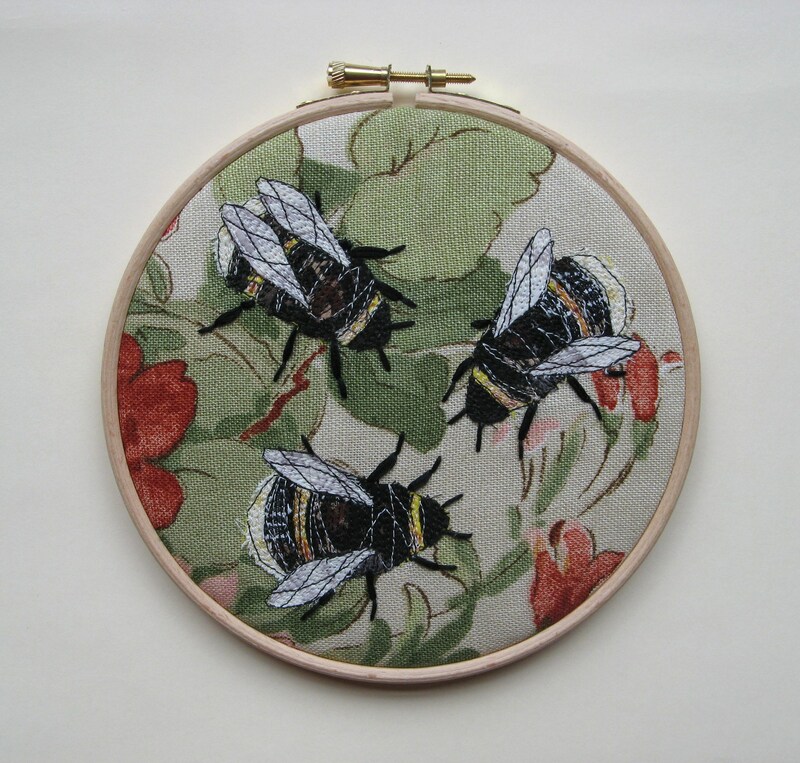 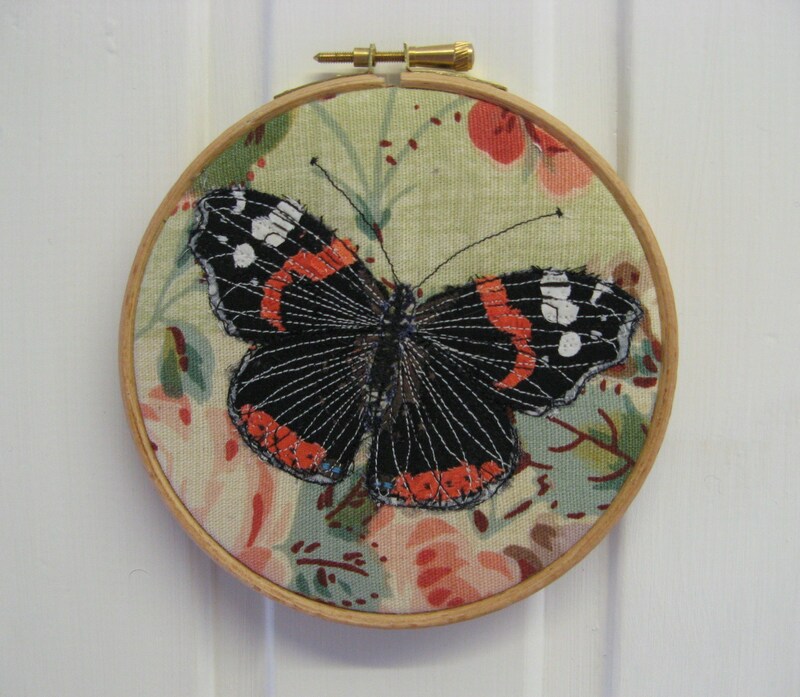 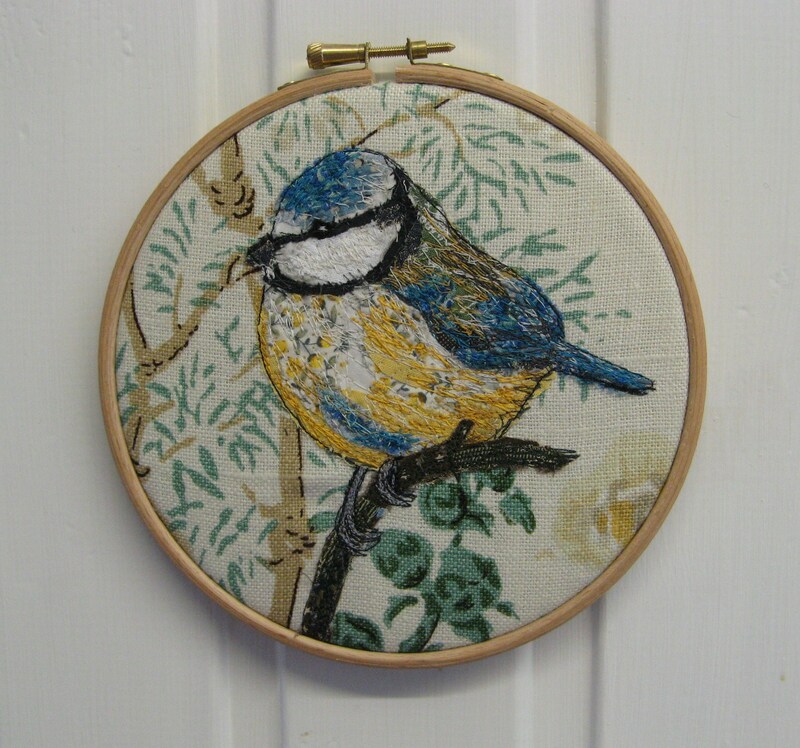 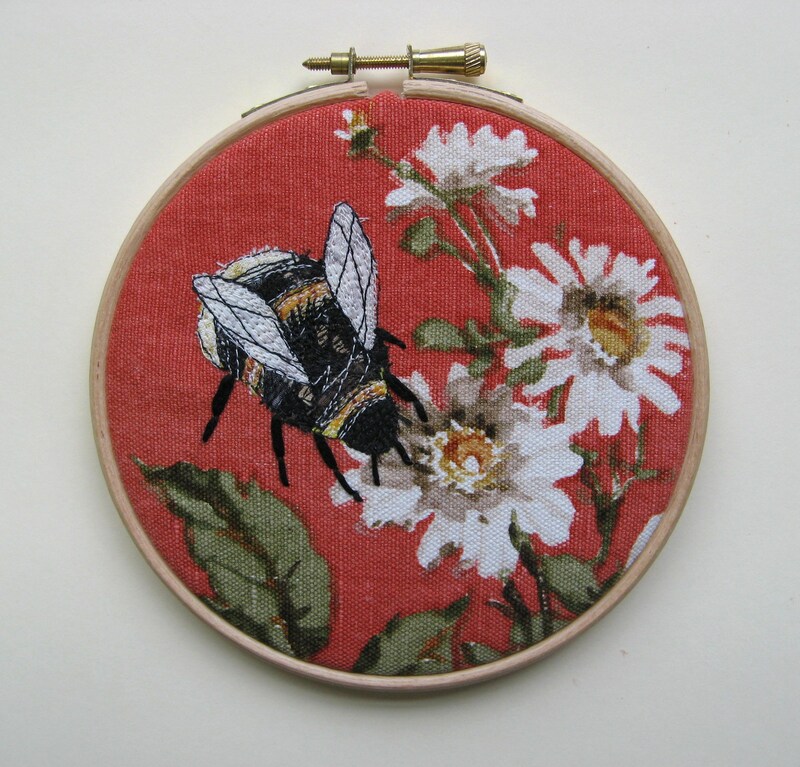 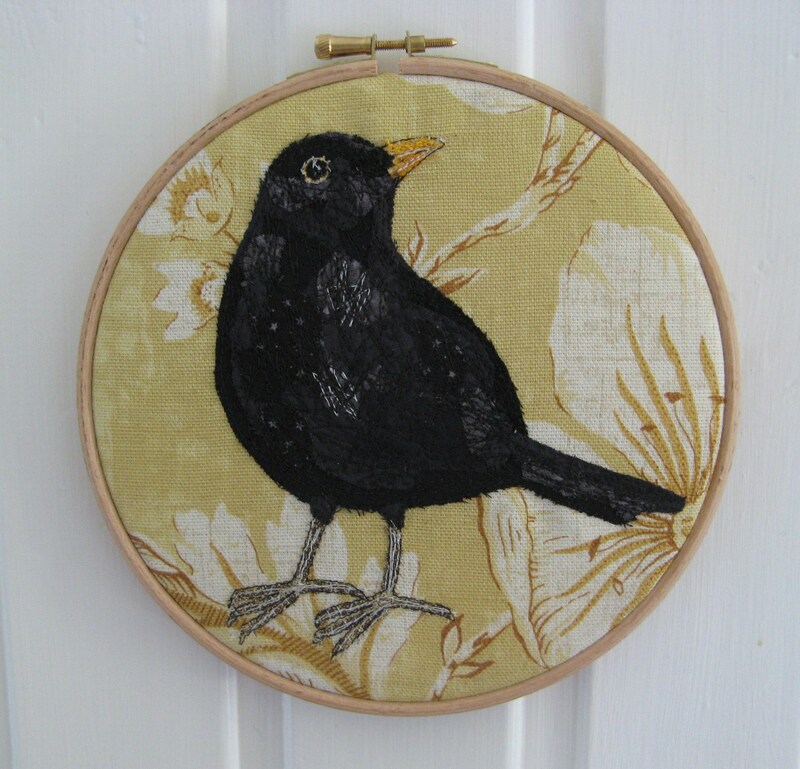 I really feel happy with my work now and I`ve settled into a style that marries four things I love; sewing, drawing, nature and vintage fabrics. 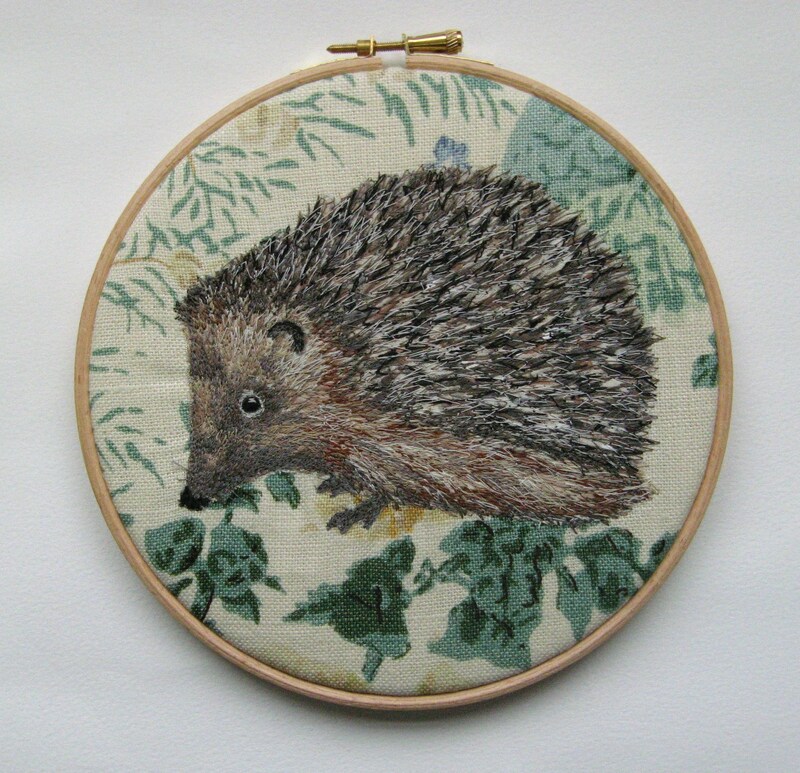 I also finally embraced the wonders of Facebook a few months ago and have built up a wonderful network of supportive people and customers. 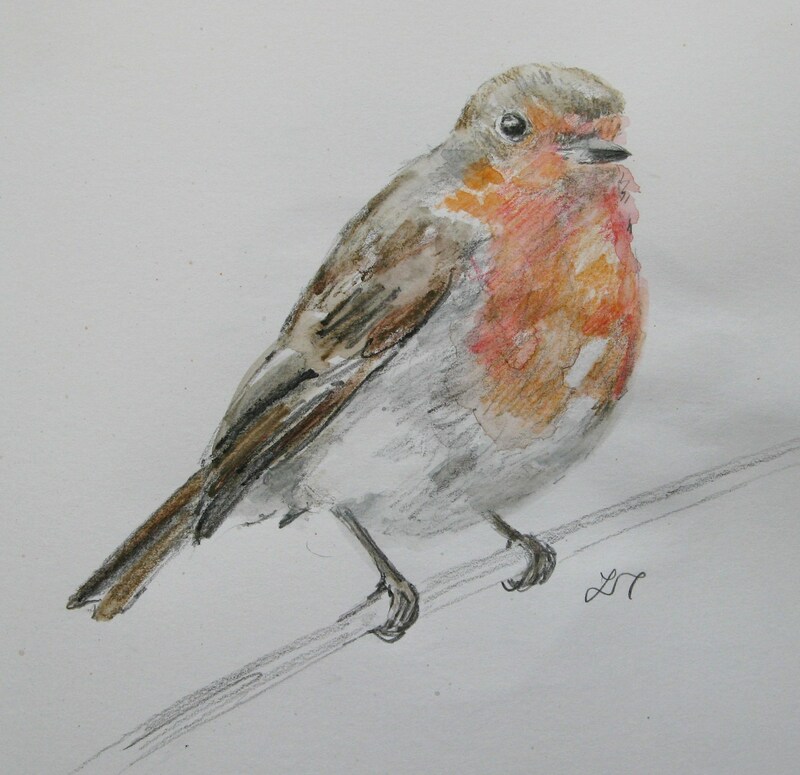 So although my blog posts have become rather few and far between, I post on Facebook daily with news, previews, sketches and finished work. 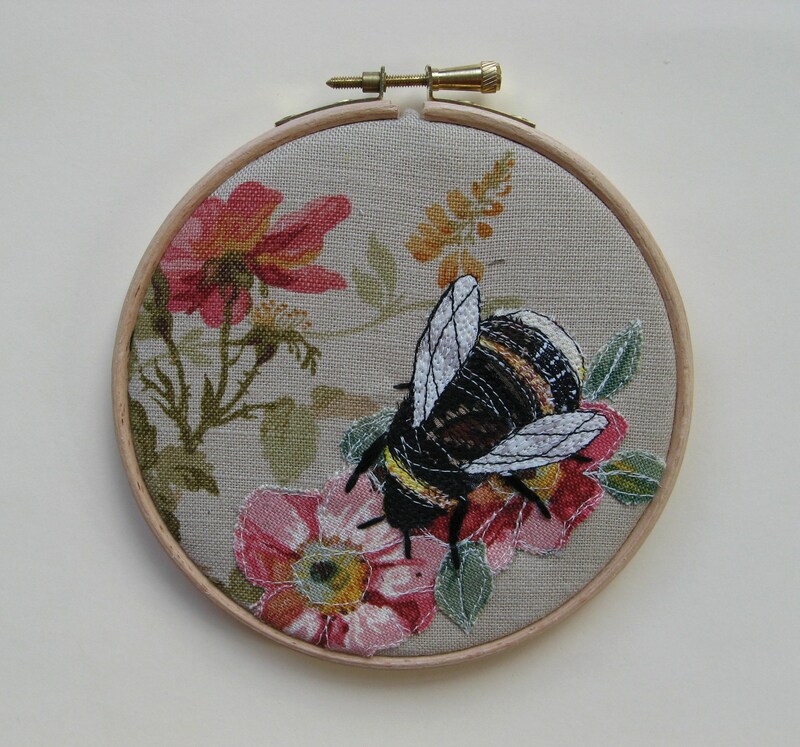 My Etsy sales have become steady too, and having the Etsy shop has really helped me focus on the style and look of my work. 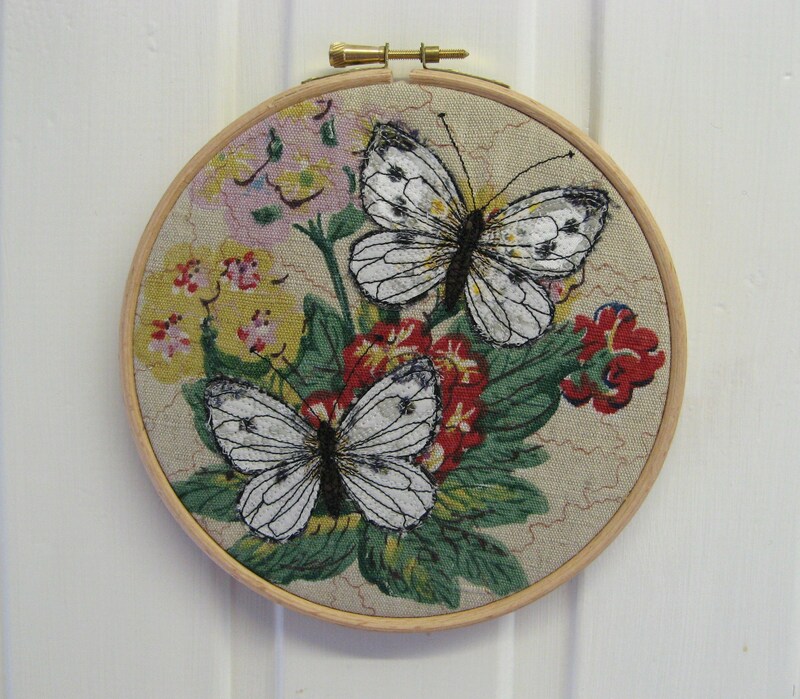 Bees and butterflies were very popular over the summer. 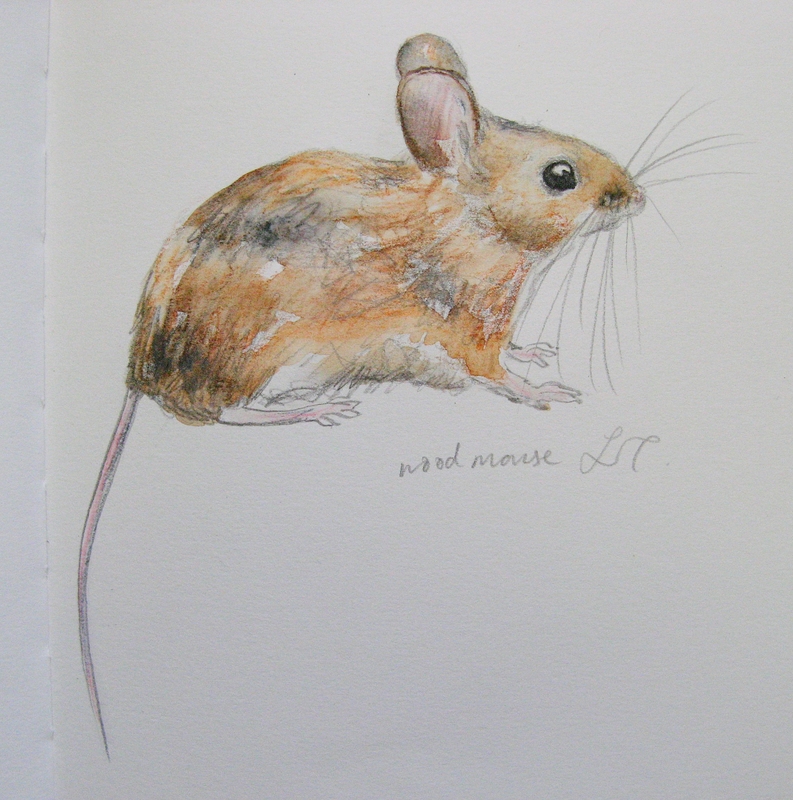 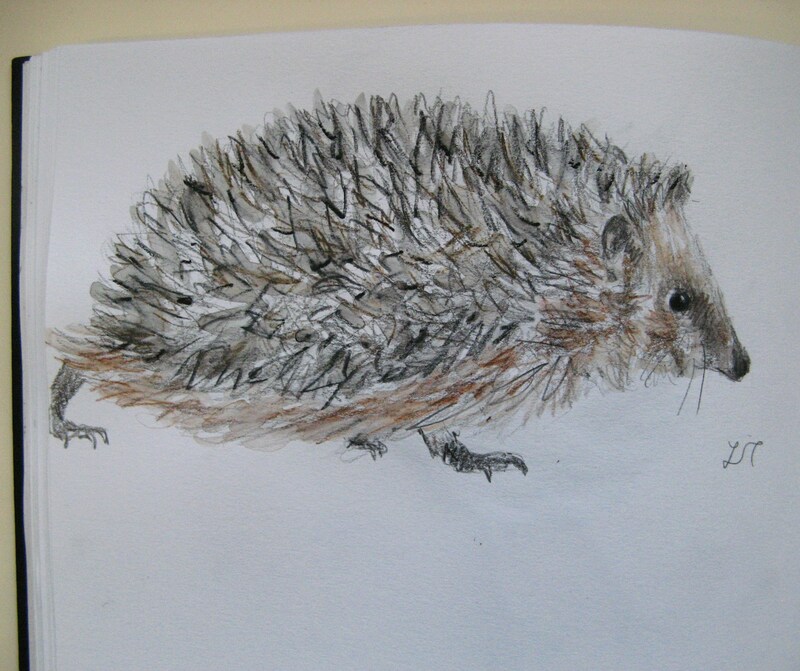 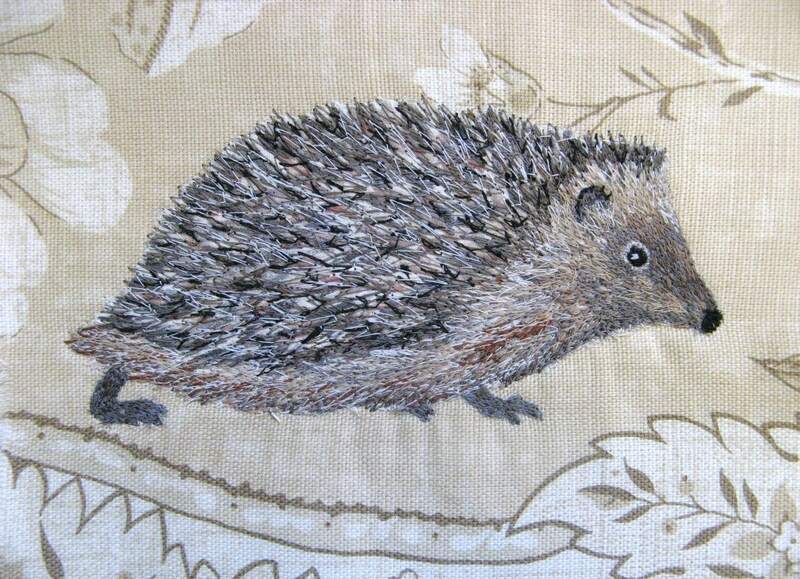 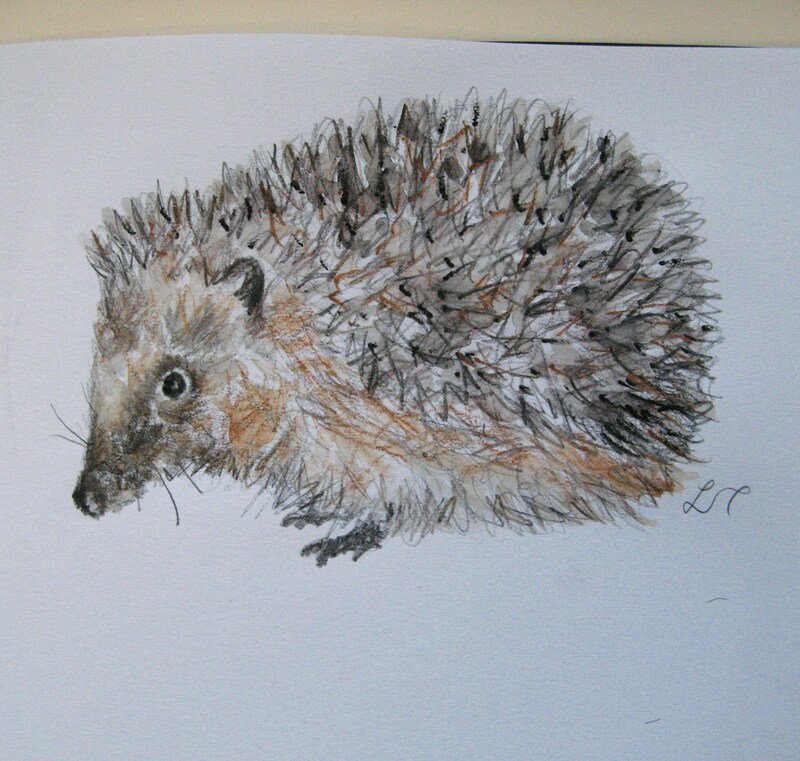 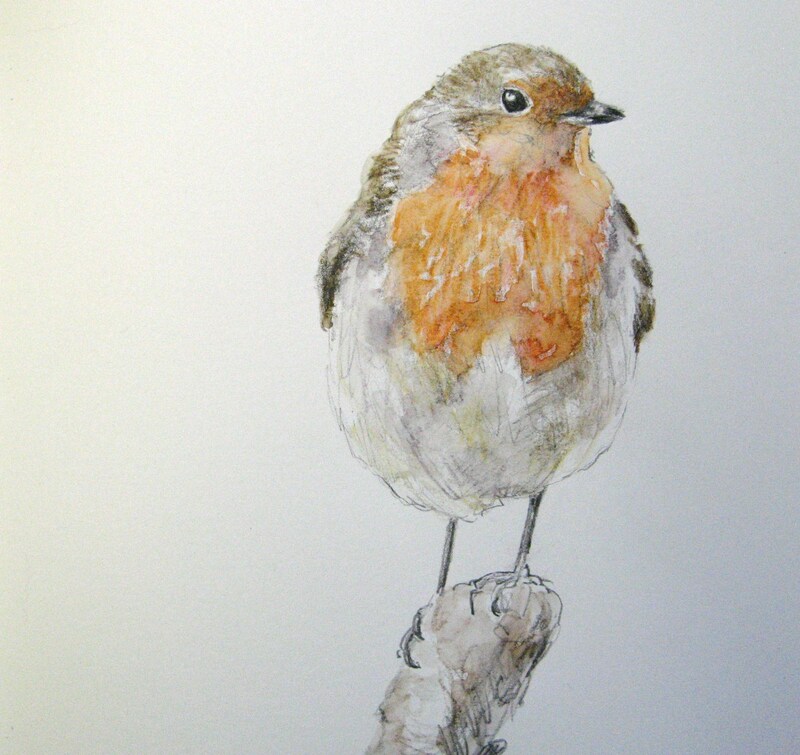 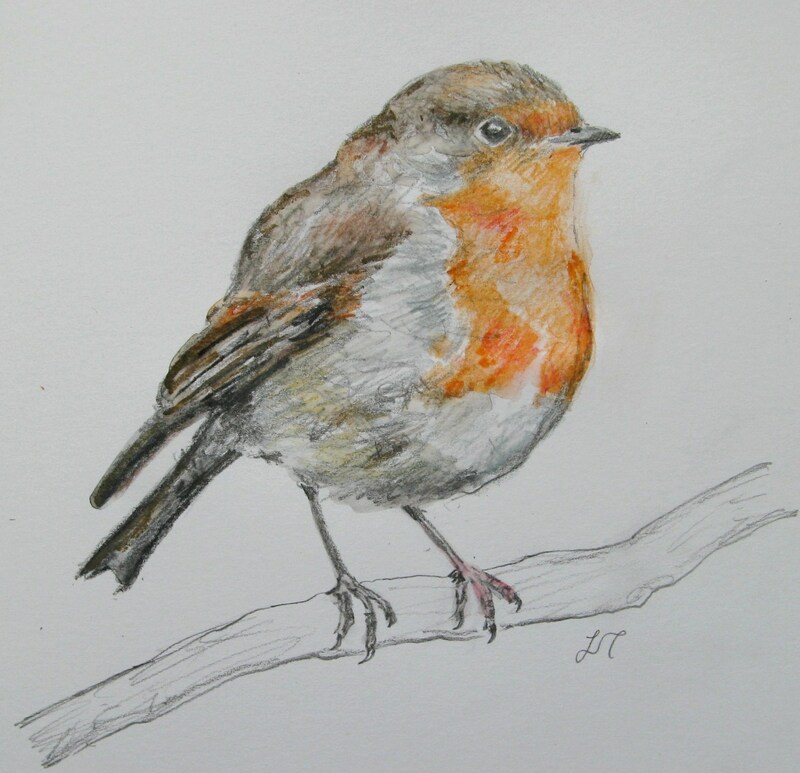 I want to work on lots of more birds over Autumn and winter and maybe some mammals (I`ve had an order for a hedgehog!). 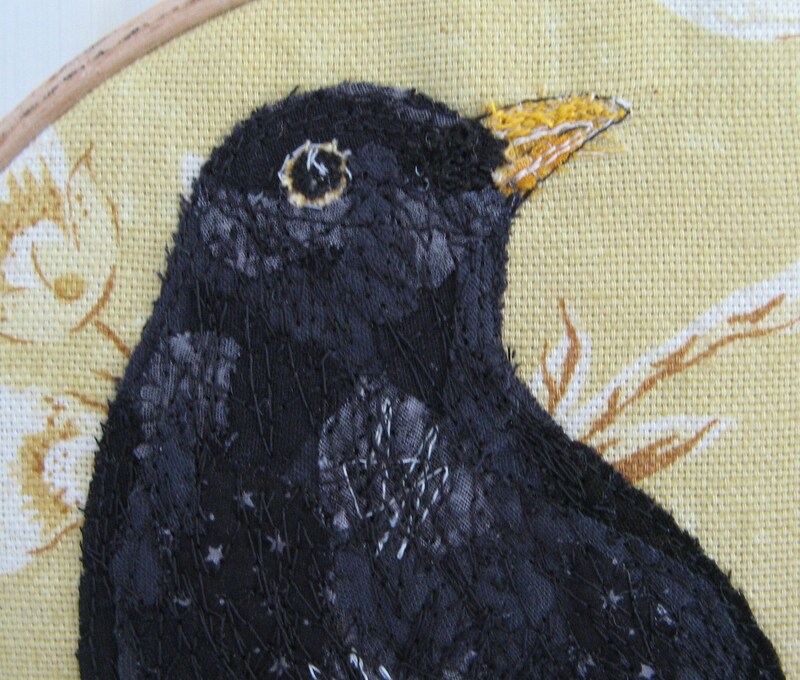 My focus over the next couple of weeks will be robins, I`ve got some lovely old linens and muted furnishing fabrics for backgrounds and some tiny 4″ hoops that would be just the right size to hang on the Christmas tree… I`ve had lots of lovely comments for my drawings too, so my next few bird drawings won`t be in my sketchbook, but for sale in my Etsy shop! 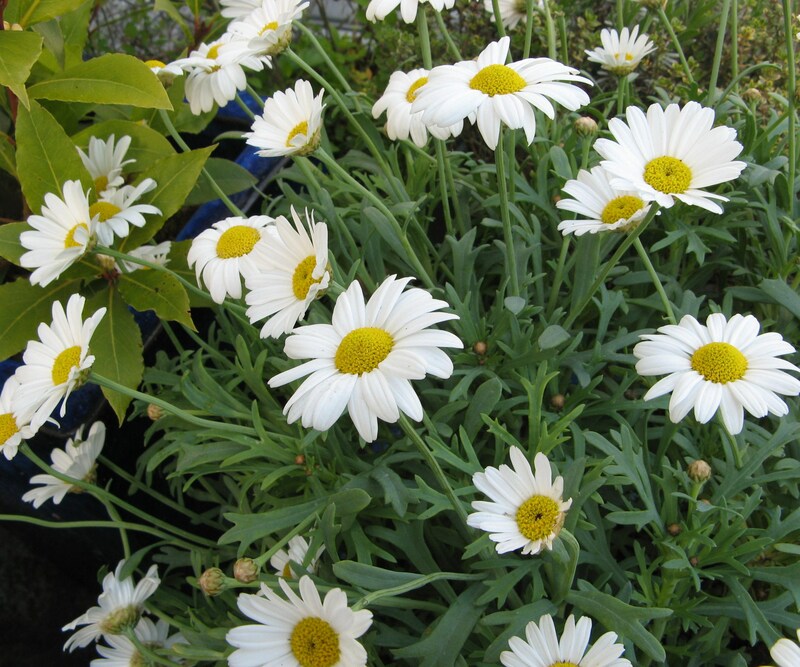 I treated myself to some lovely marguerittes for the garden this week and they instantly added a dash of cheerfulness and sunshine. 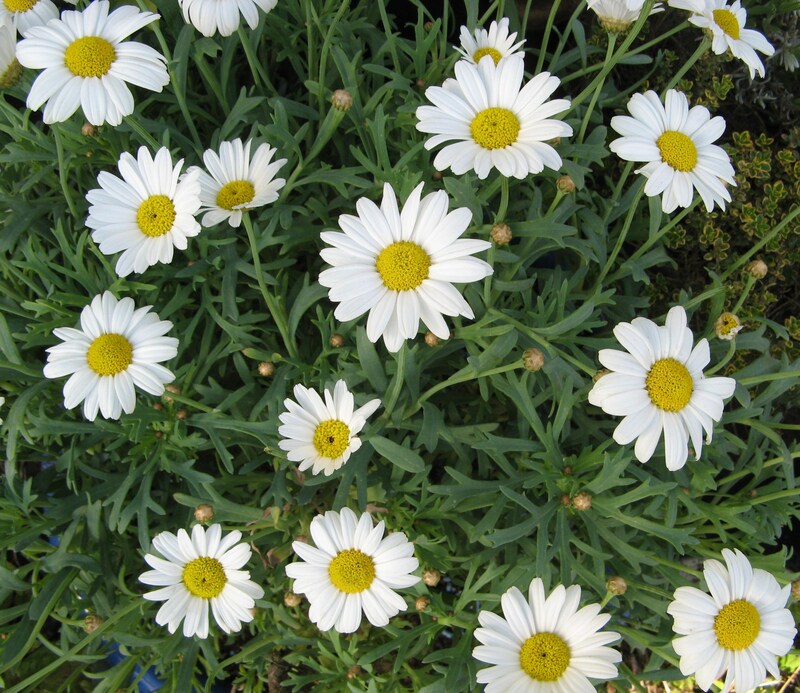 There really is something about daisies that lift the spirits. 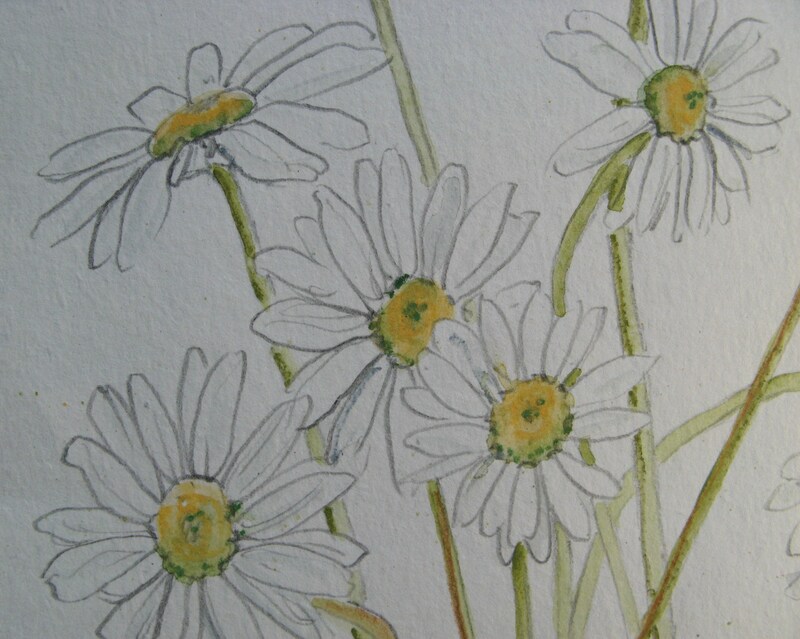 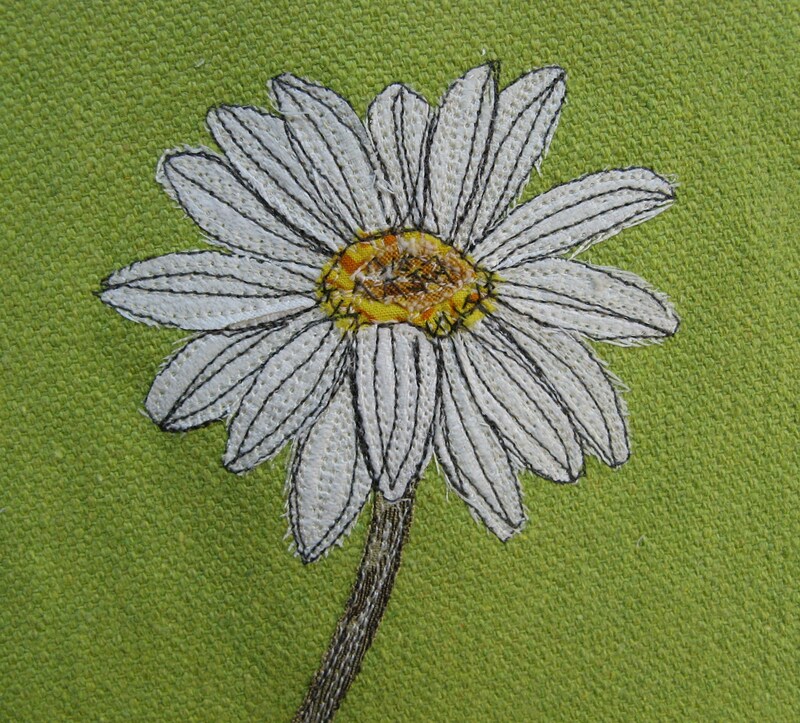 I felt inspired to try some daisy embroideries, taken from the sketches of ox-eye daisies I did last year. 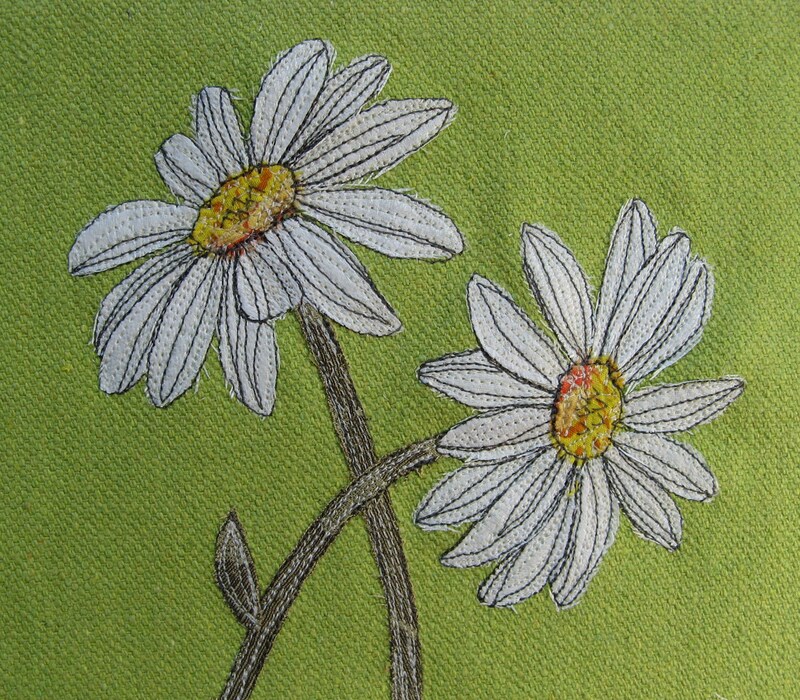 My friend recently gave me a bolt of vintage white glazed cotton and this is perfect for daisy petals. 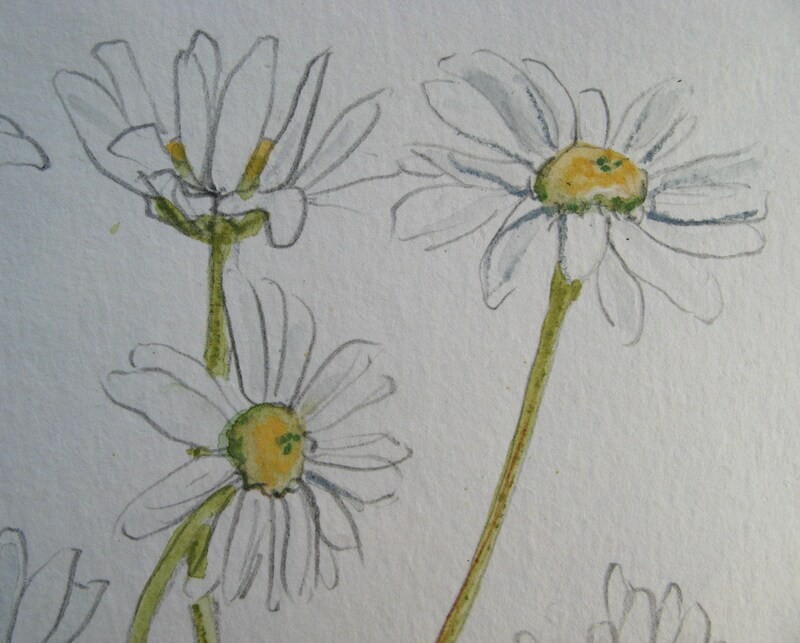 So crisp, lovely to cut into and gives the daisies a lovely lustre. 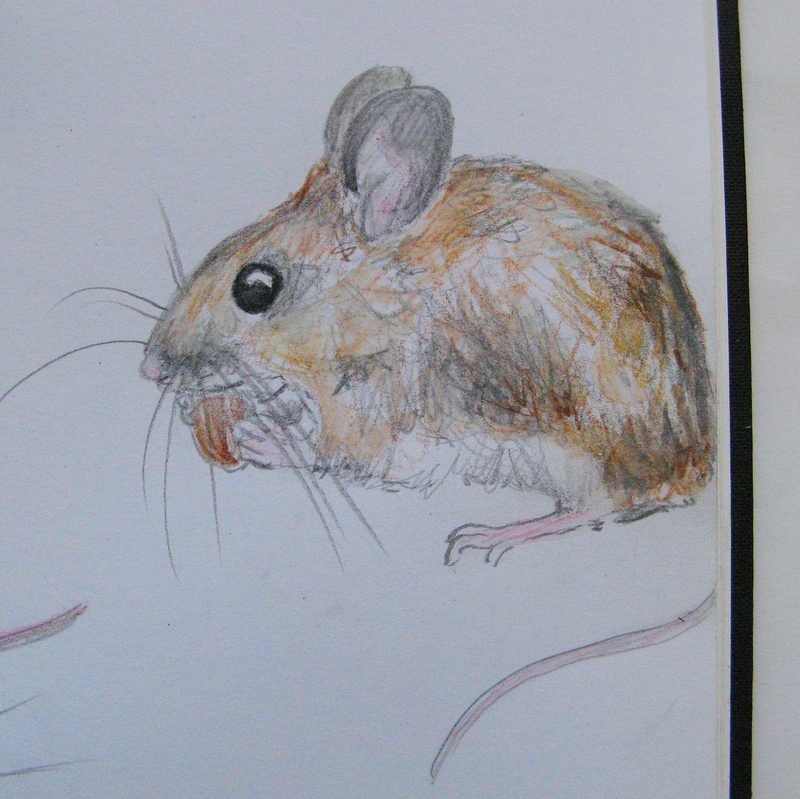 I chose some bright, fresh, yellowish-green for the background. 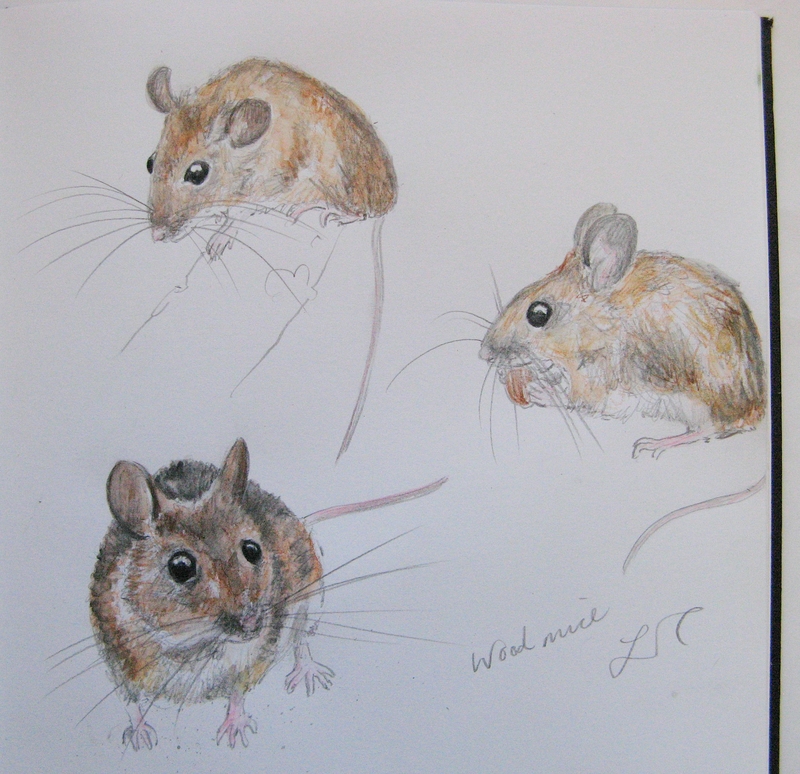 Really pleased with these, I tried to make them as realistic and ‘drawn’ looking as possible. 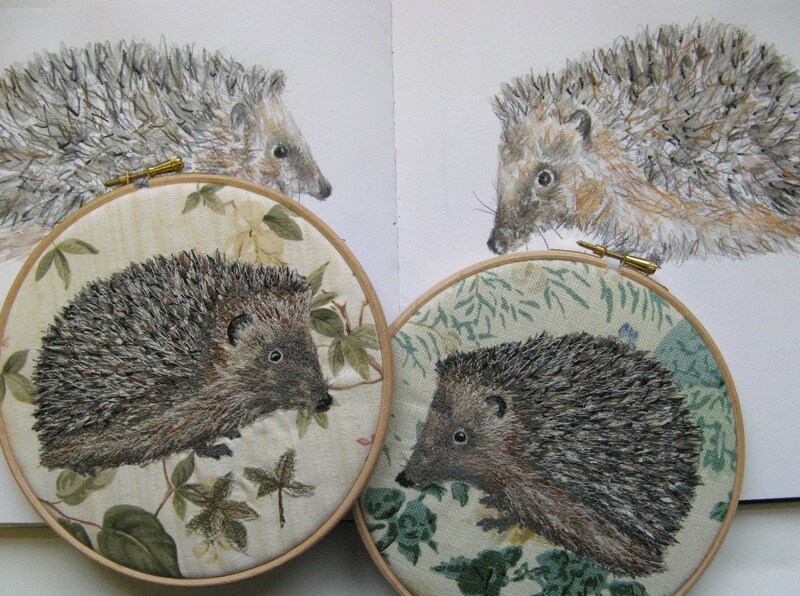 I`ll put these in my Etsy shop, perhaps set in embroidery hoops. 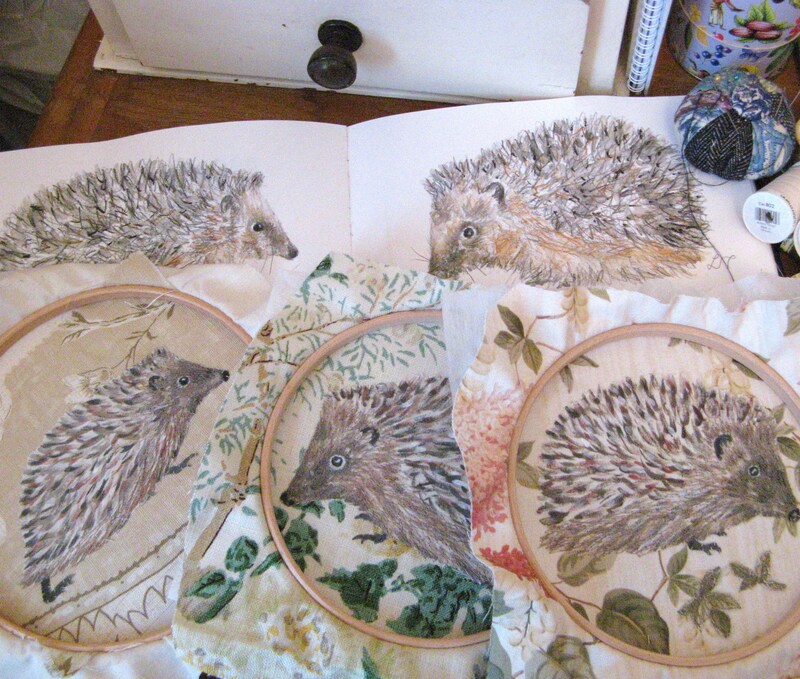 I`d like to do a bigger piece, perhaps a large cushion or wall hanging featuring a whole swathe of daisies. 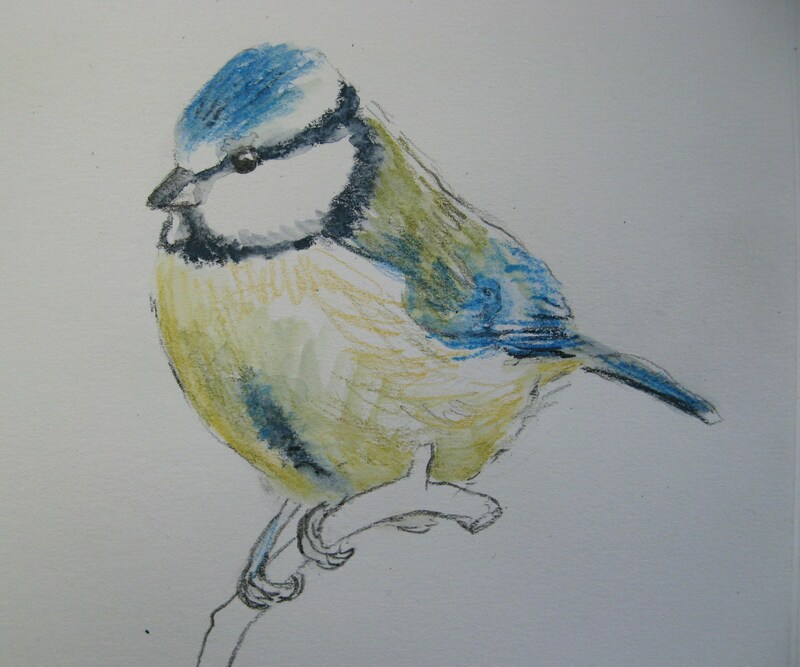 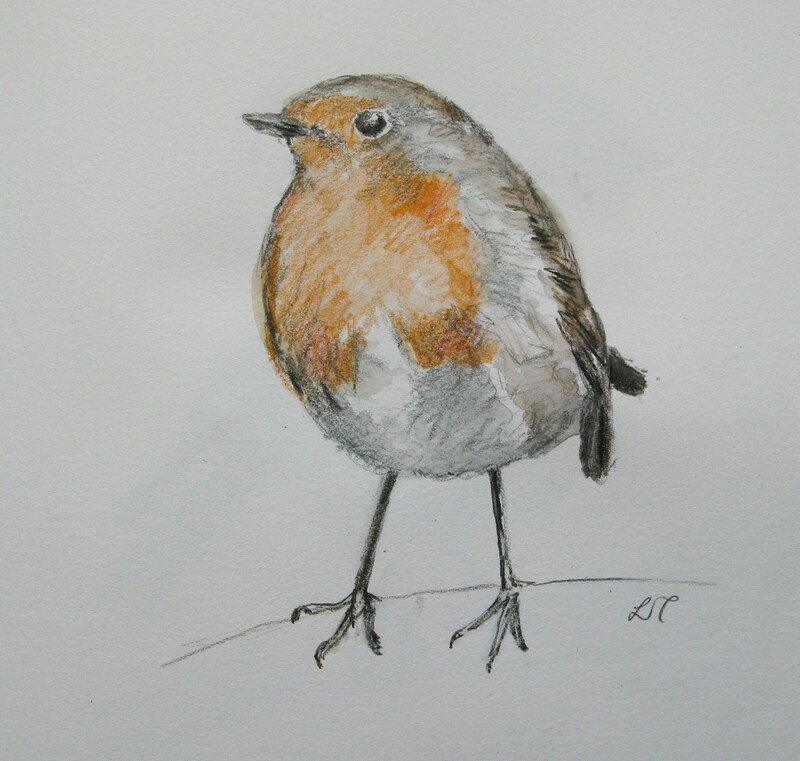 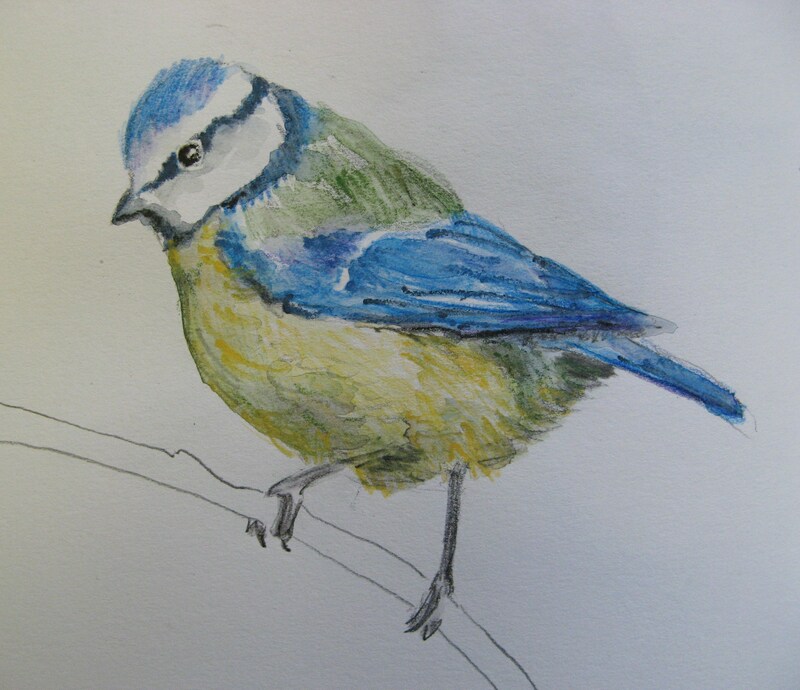 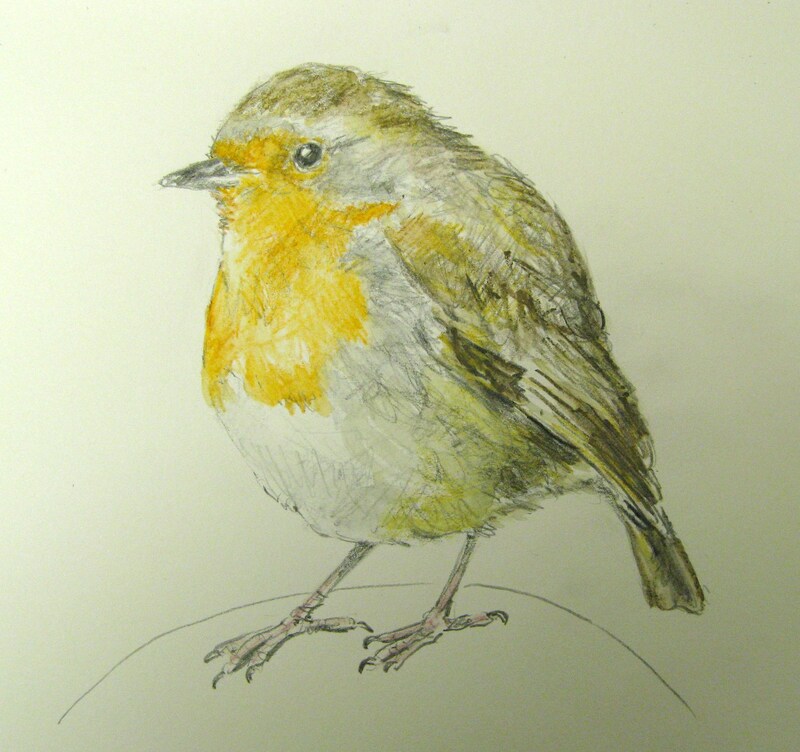 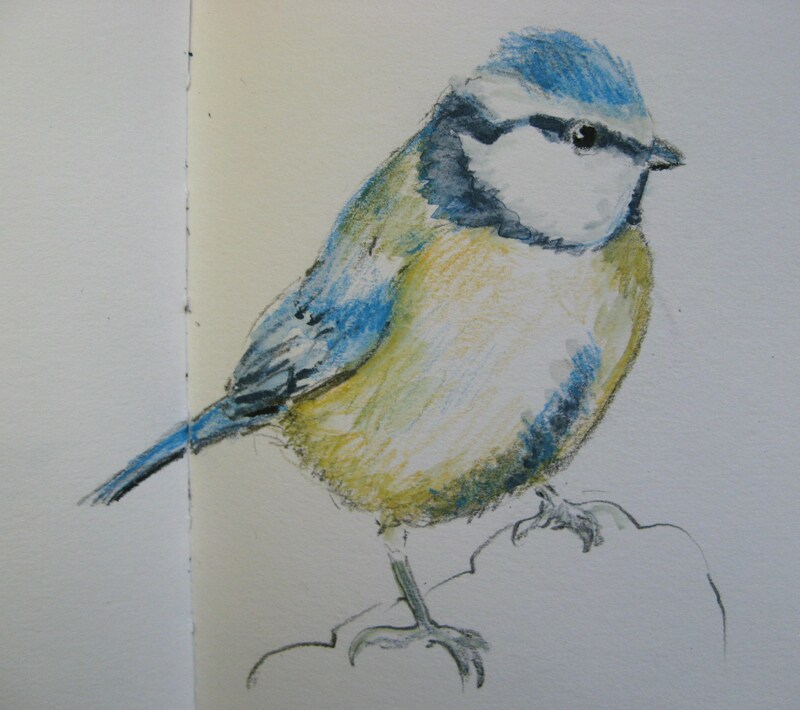 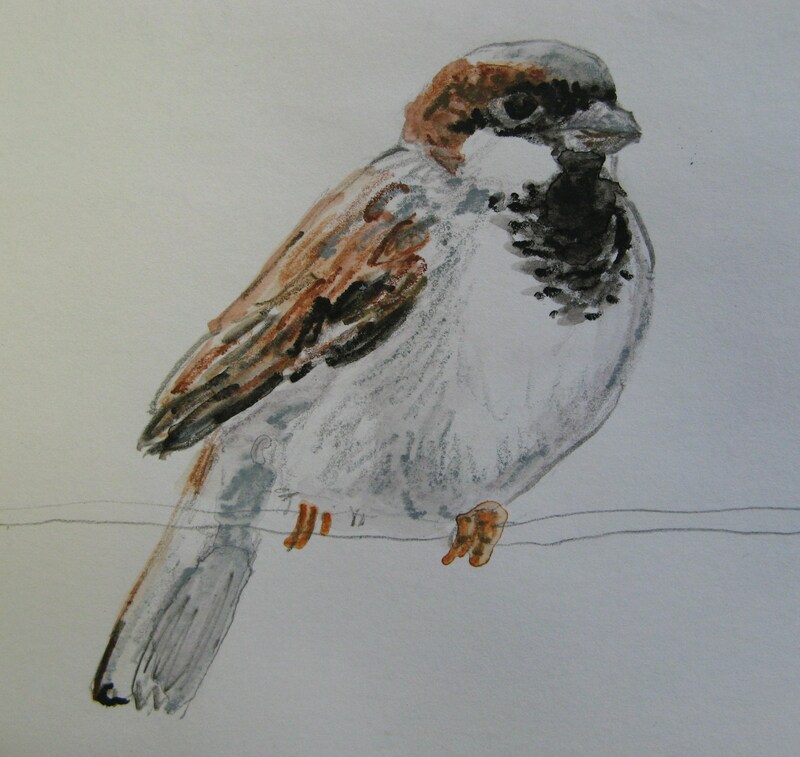 I`ve been filling my sketchbook with drawings of garden birds this week. 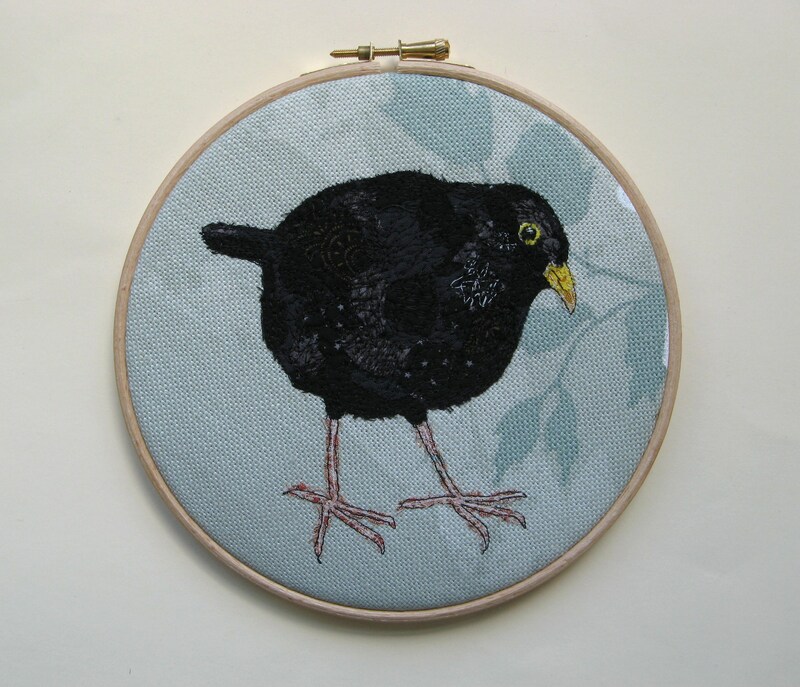 I really want to include birds in my work, especially the ones that fill my garden every day. 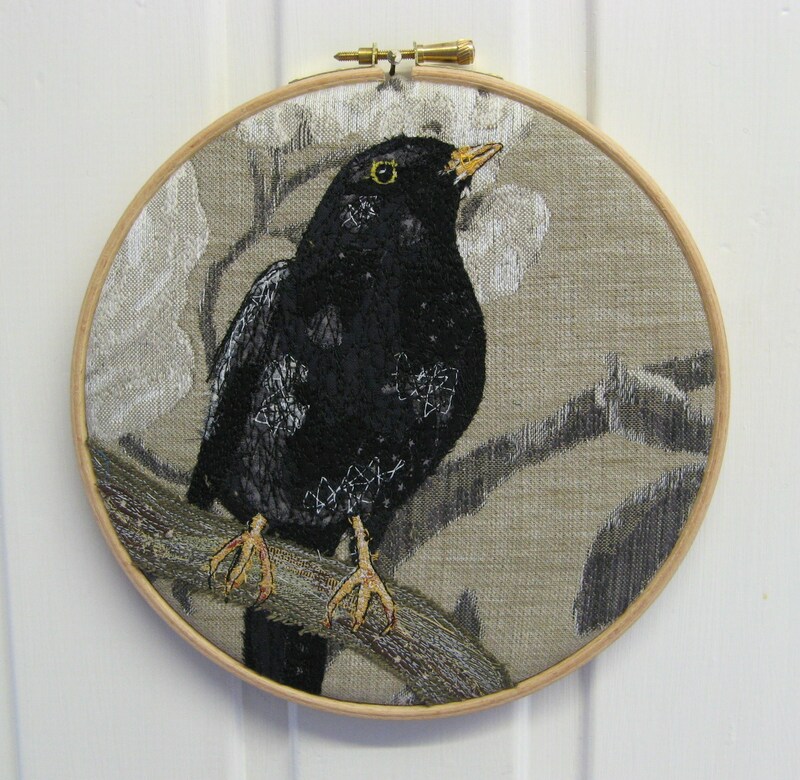 I try to encourage as many birds as possible to the garden- my apple tree is like a bird cafe, hung with lots of feeders, and the first thing I do in the morning is go out (in my nightie) to feed the birds. 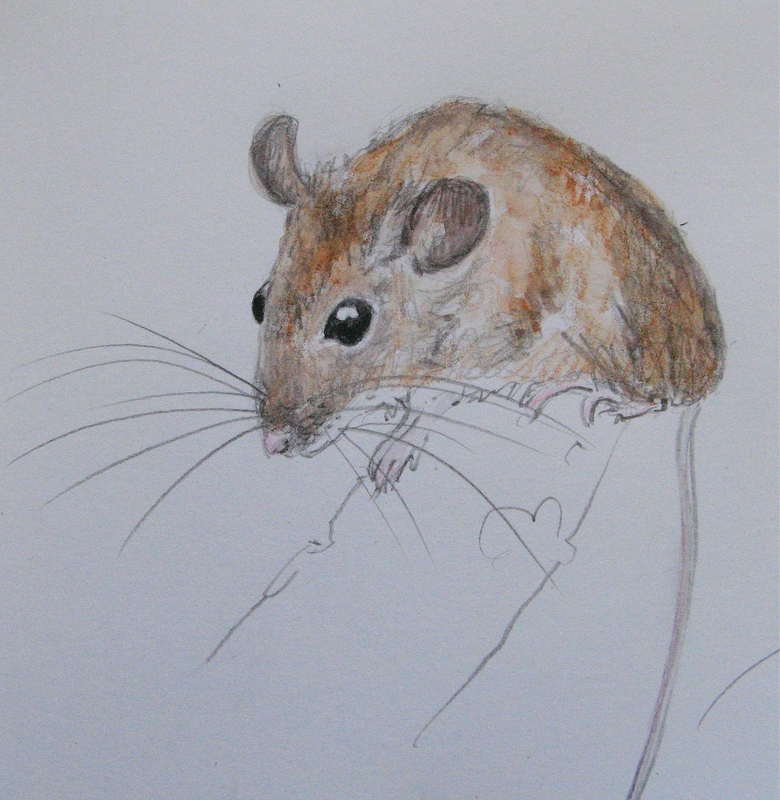 They are quite partial to crushed digestive biscuits. 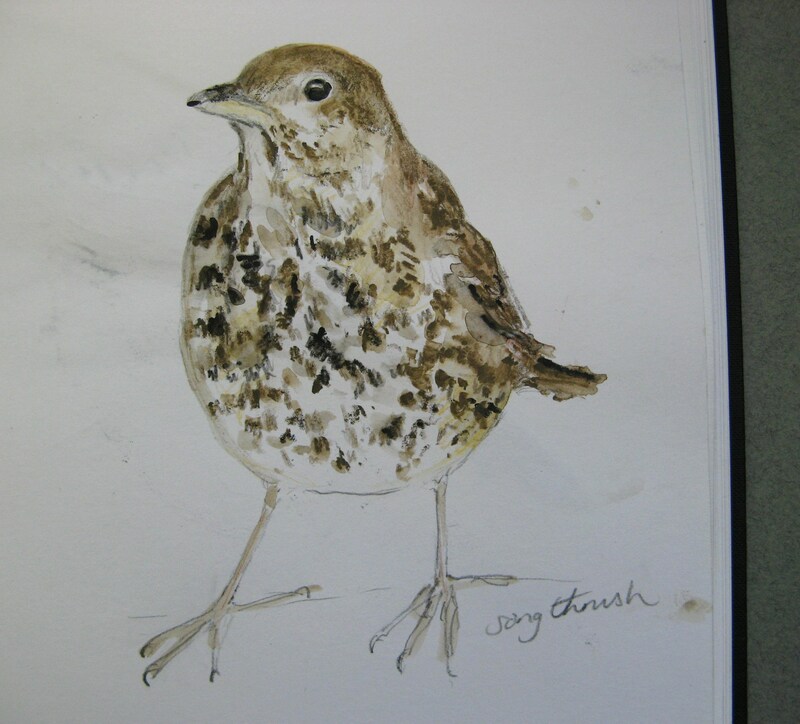 There is a beautiful thrush that can be seen hopping about on the grass most of the time. 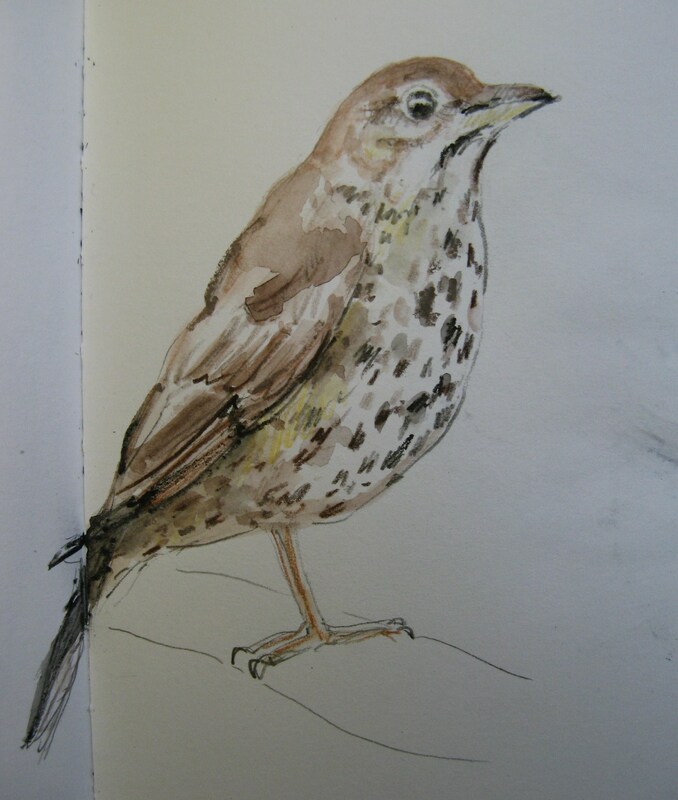 Thrushes are really welcome, hopefully they`ll keep the large numbers of slugs and snails down a bit. 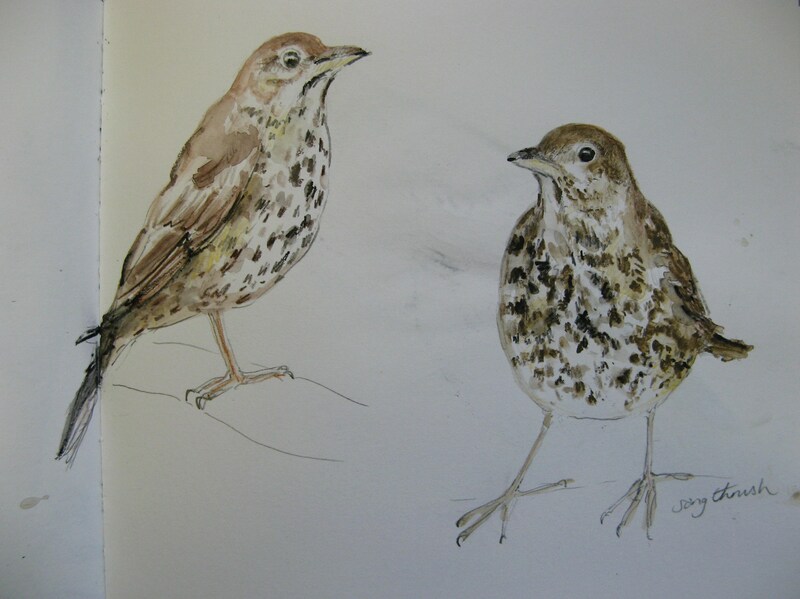 I love to listen to their amazing song on summer evenings too. 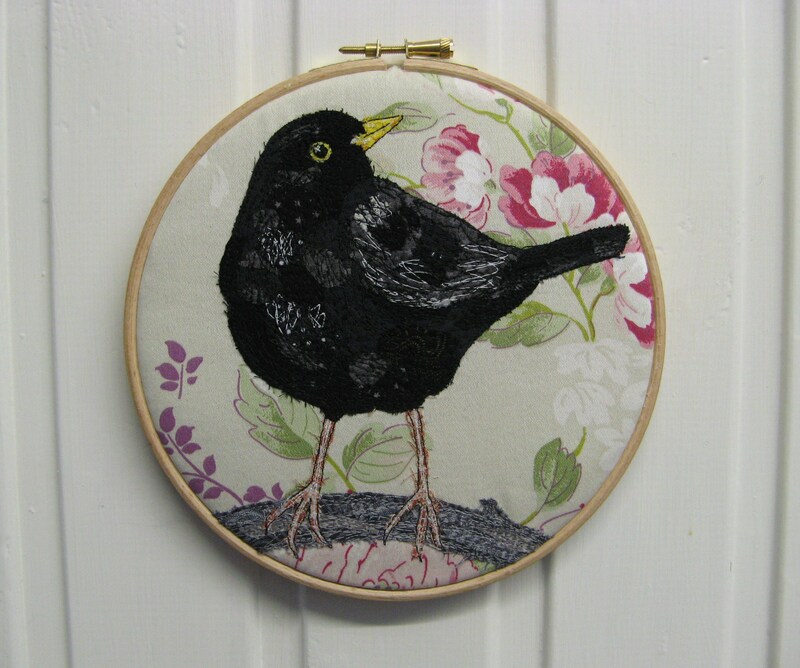 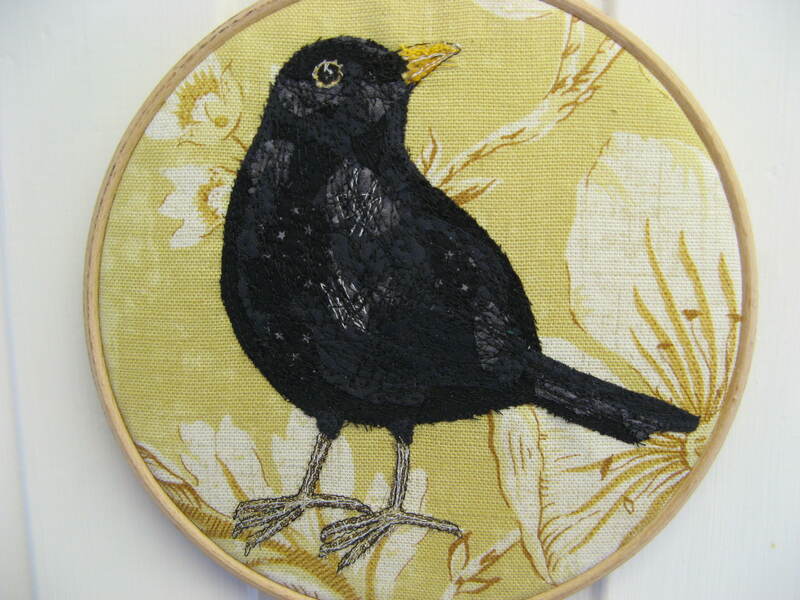 Blackbirds are probably my favourite garden birds. 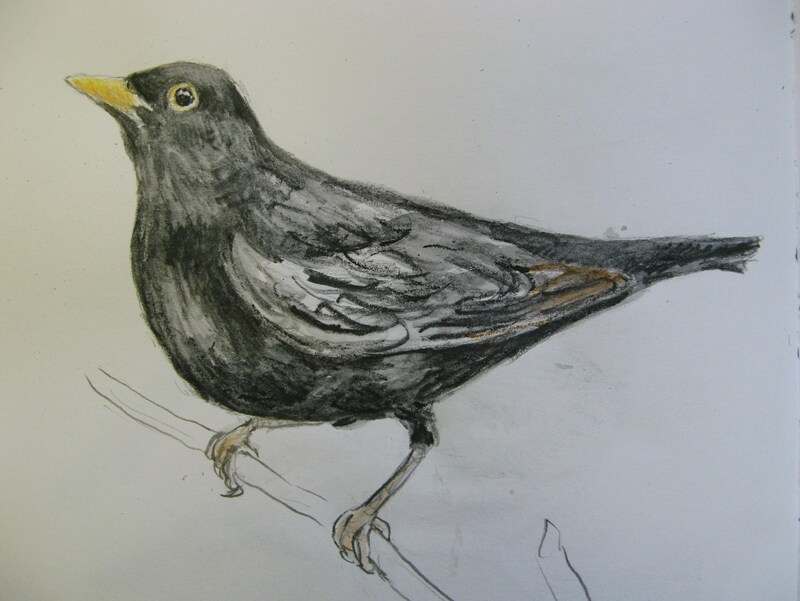 The glossy black males are so handsome (they seem to know it too!) 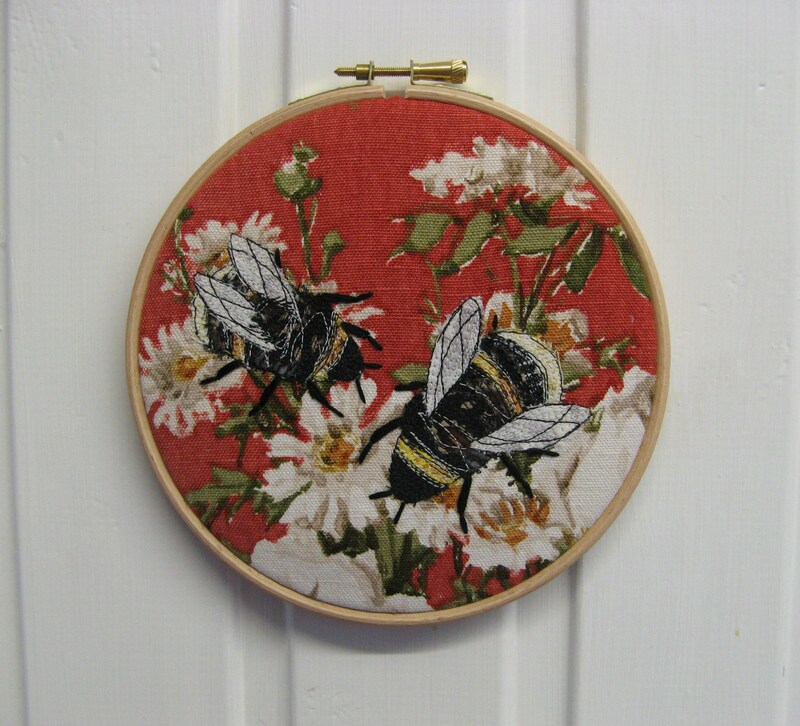 and I really love their gorgeous, liquid song. 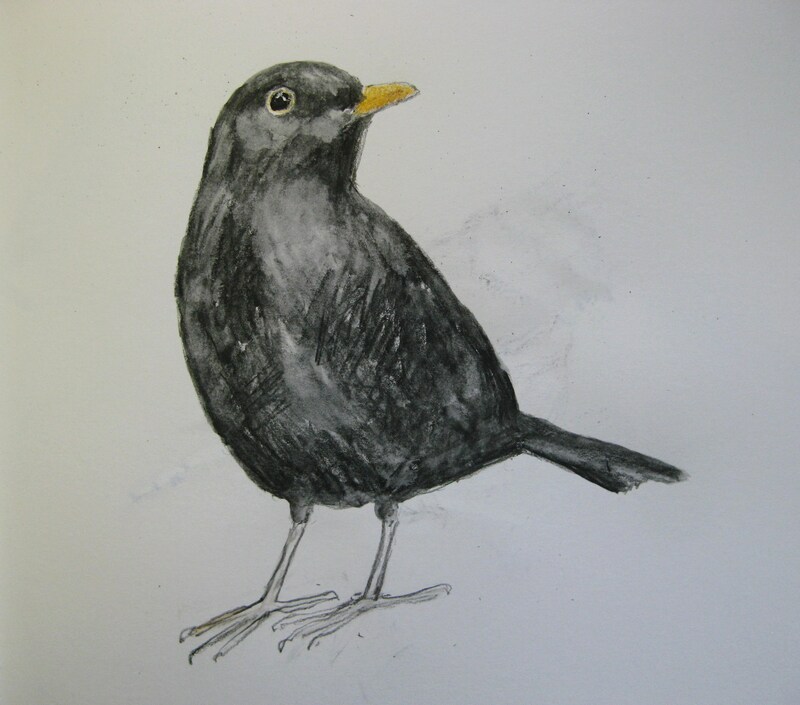 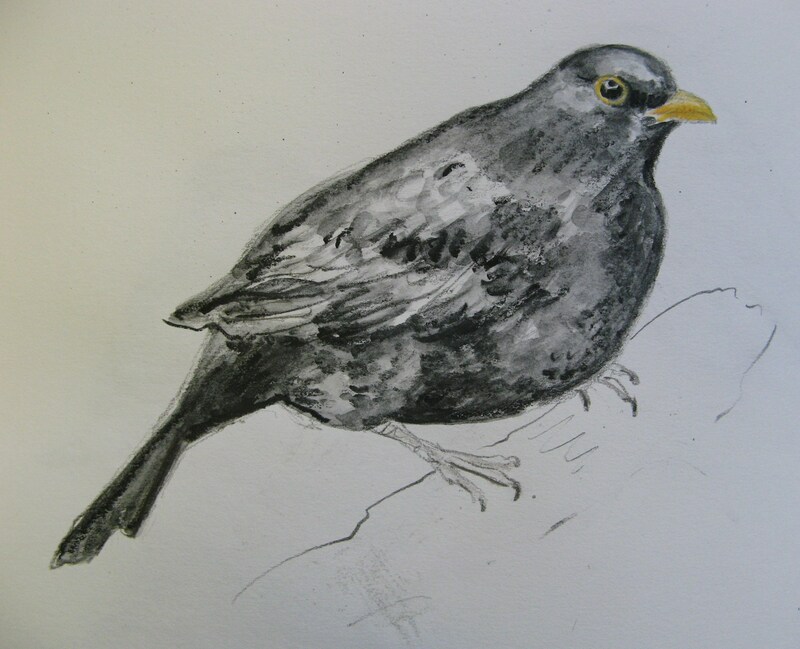 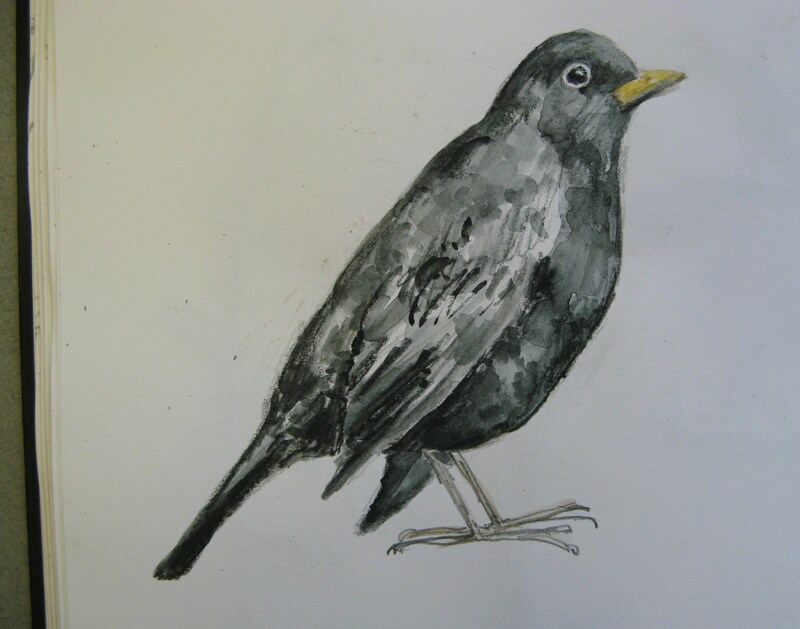 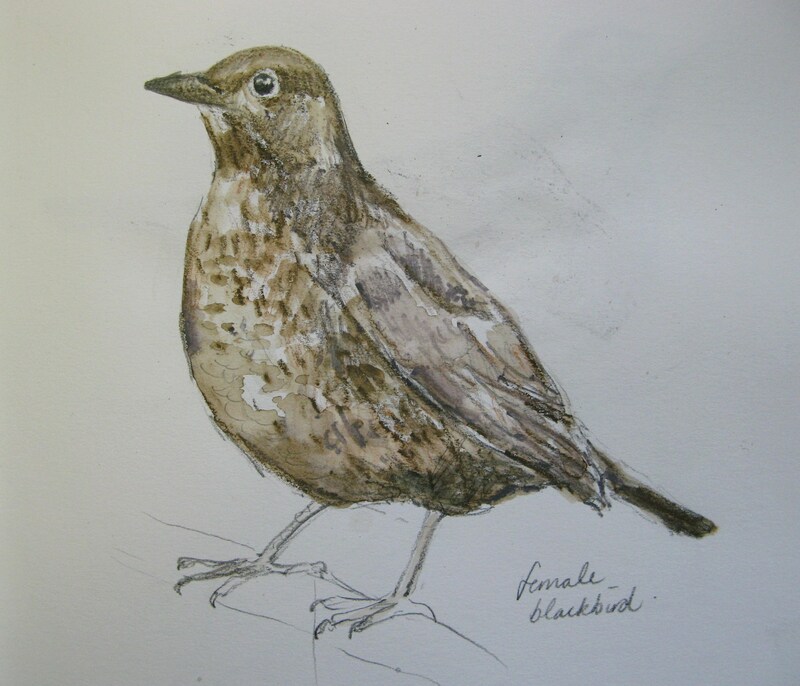 There is a pair of blackbirds that have become quite tame, especially the female, which I have rather unimaginatively called Lady (well she is a ‘lady’ blackbird…). 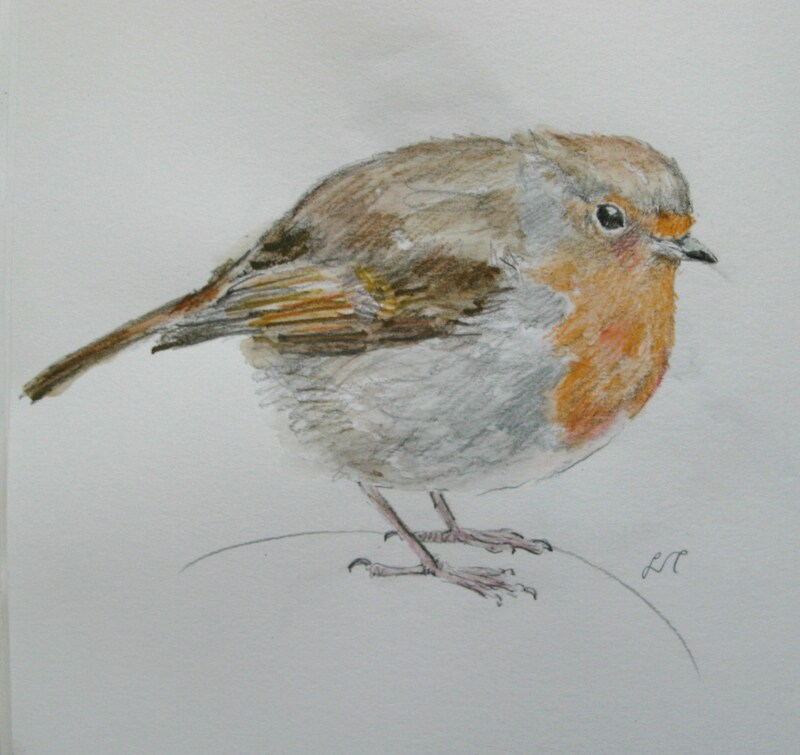 She`s never far away when I`m in the garden and always lets her presence known with a friendly soft clucking noise. 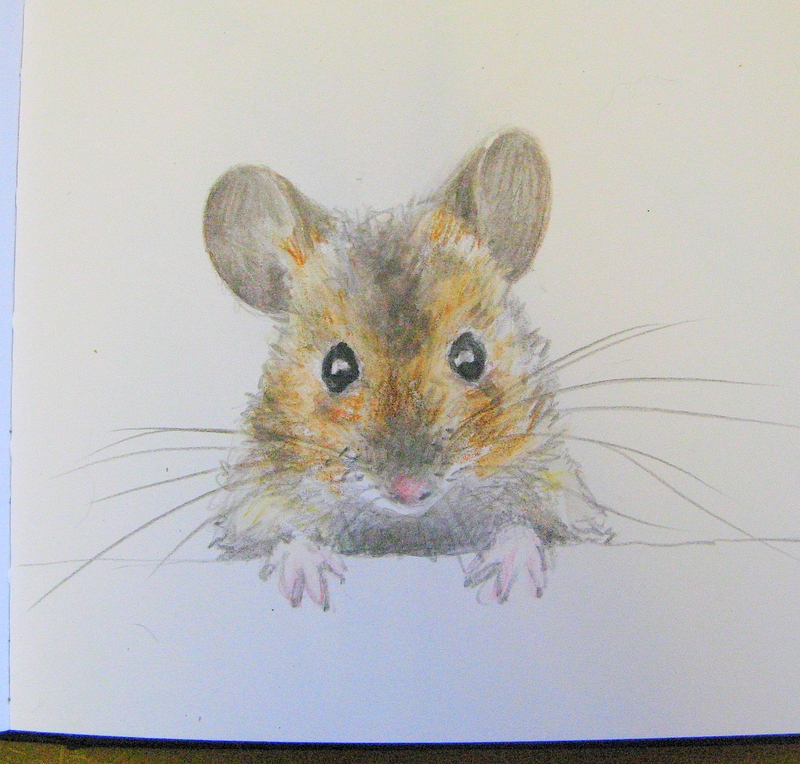 She`s quite demanding too and always appears first thing in the morning for her breakfast. 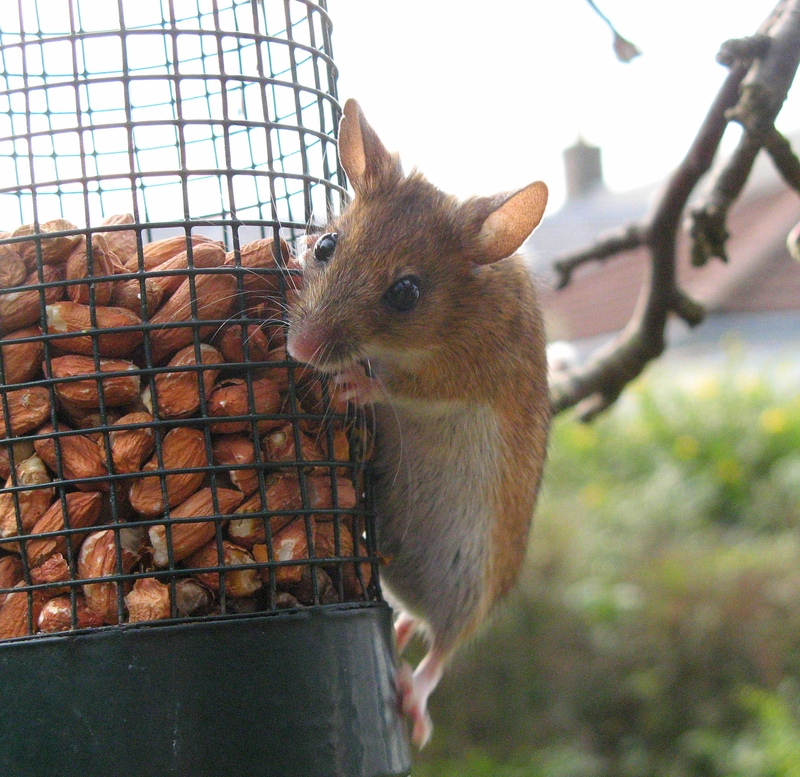 They have built their nest in the hedge again this year, as close as possible to the bird table! 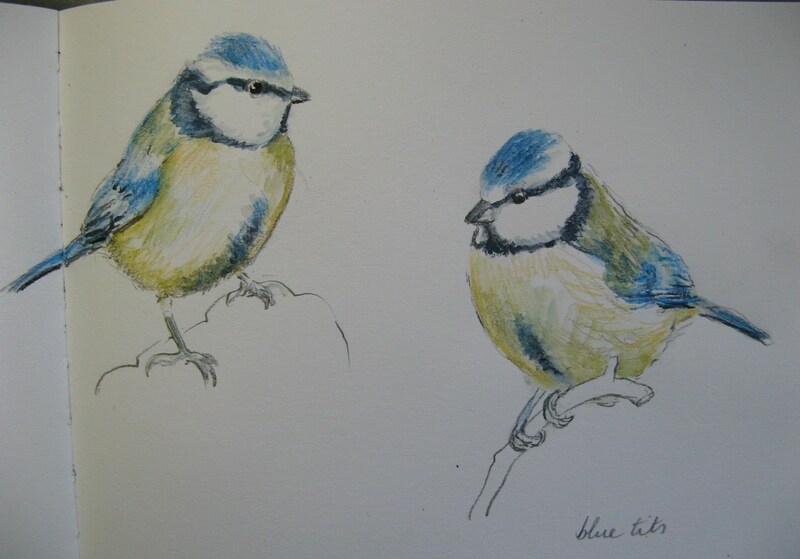 Bluetits are so colourful and cute. 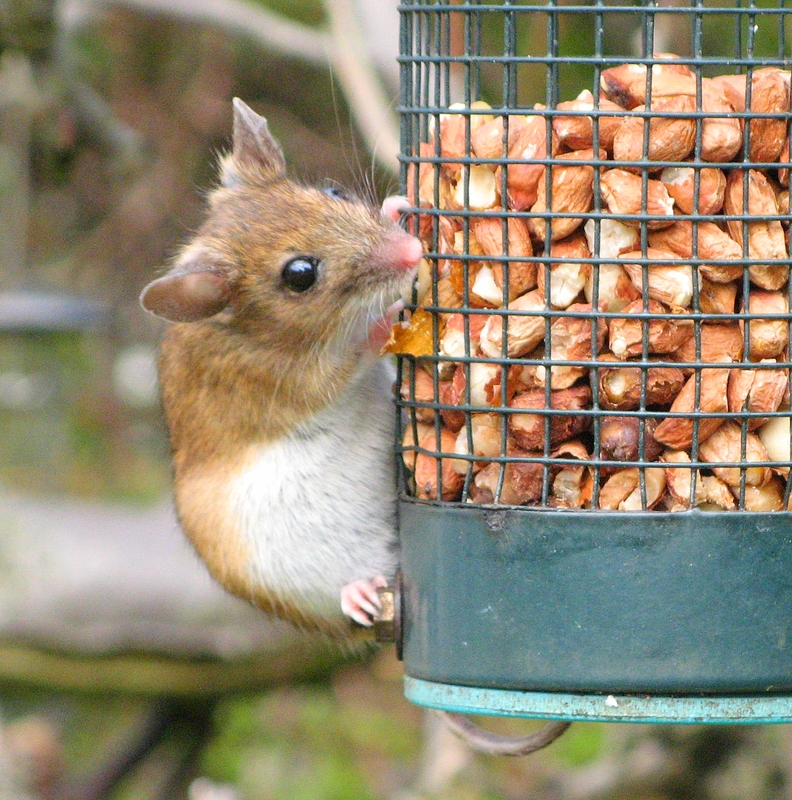 There are always lots of them around the feeders on the apple tree. 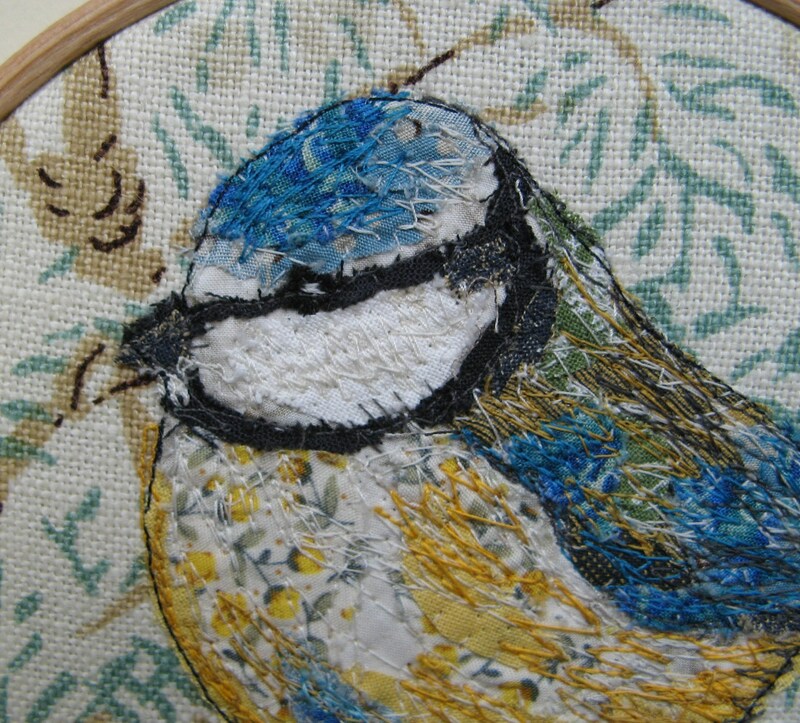 I`m going to continue this week, there are lots more birds I want to try to draw, then hopefully the drawings will inspire some stitched pieces.